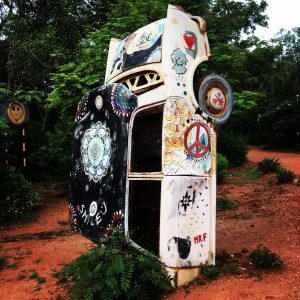 Is Auroville worth visiting for Digital Nomads? 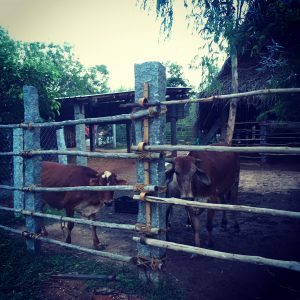 Home » Asia » Is Auroville worth visiting for Digital Nomads? Auroville in south-eastern India is certainly a very different place in the world. Born over 50 years ago as a reaction to the tension of the Cold War days, Auroville is a social experiment exploring alternative, spiritual values-led human societies. After enjoying my first visit last August, I returned to celebrate Auroville’s 50th anniversary on February 28, 2018. 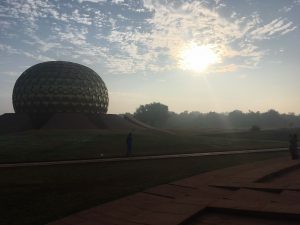 After stepping offline for a 10-day silent Vipassana meditation retreat in Tiruvannamalai, I spent another week decompressing back in Auroville. The more time I spend in Auroville, the more it grows on me. The more of a local routine I fall into, I gain a greater appreciation for the healthy air, environment and spiritual values. Every day in Auroville, I discover something new, I learn something, inspiration hits. But is Auroville truly suitable for digital nomads? What and Where is Auroville? Auroville is an experimental township in the south east of India, next to Pondicherry, and a few hours south of the Tamil Nadu state capital, Chennai. Currently host to approximately 3000 residents, Auroville was born over 50 years ago. It operates under a different economic system, leadership through consensus, and in some ways its bureaucracy is clearly rooted in the 60s and 70s. Auroville is often resistant to substantial new change or taking on influences from the outside, and its slow pace of integrating new residents – or Aurovillians – has impeded its growth. The original target of tens of thousands of residents is but a fraction – and the population is aging rapidly. 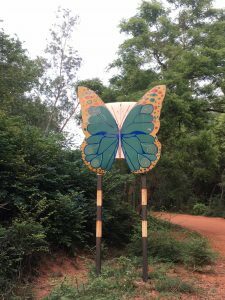 One of Auroville’s most impressive features is how the land originated as red, clay-like desert, and has since, over the decades, transformed into lush rainforest, reinvigorating a great new number of natural species of flora and fauna… and insects. There are dozens of guesthouses, workshops and small enterprises that operate within Auroville. Many guesthouses have different, inspiring names like Gratitude, Discovery, Creativity, and Aspiration. On my first visit I stayed at a guesthouse called Transformation, an architectural masterpiece from the 70s, in the quiet northern forest area. 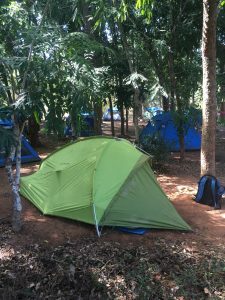 More recently I pitched my tent at African Pavilion and helped volunteer during Auroville’s 50th anniversary celebrations. There is something for anybody with an open mind, to experience an alternative viewpoint in how societies and communities can thrive. At first I was skeptical that Auroville was suitable for this sort of freelance work lifestyle. The wifi wasn’t great in some places, and a complete lack of any mobile coverage in others. It became a little expensive constantly working from cafes and restaurants. It can be distracting with all the stimulating places and people to explore! After my second visit, I adapted, improving my routine and productivity. I balanced an immersive social life with accomplishing my necessary work. Highly affordable – close to many local Indian restaurants and accommodation. Auroville itself is only a little bit more expensive than the average Indian prices. Quiet and peaceful. There is an ocean and beaches nearby, though not the cleanest. 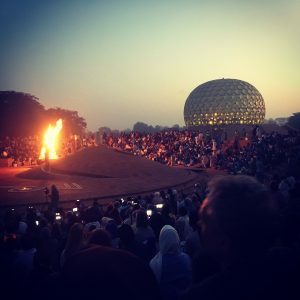 In particular, there is just enough highly passable connectivity in Auroville, while encouraging you step away from your devices to enjoy what the locale has to offer. Tired of being a computer programmer or writer? There is an abundance of (mostly) free workshops and volunteer opportunities where you can explore new skills and interests. The one conflict against digital nomadism in Auroville is in its non-commercial, sort of vibe. There’s a little bit of an irony of establishing oneself there purely for the purpose of computer-based work. The soul and spirit there reiterates that there is so much more to life. Wifi accessibility is gradually improving in Auroville. 3G/4G does not reliably work in the centre, and many guesthouses intentionally restrict it. 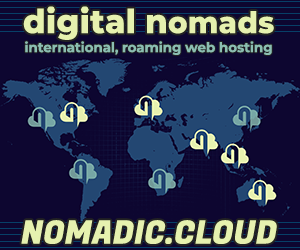 That said, there are several places you can acquire sufficient wifi for your digital nomad and freelancer work. Well Cafe – A health-oriented cafe in the quieter north part of Auroville, designed for vegans and vegetarians. Food is fresh, Israeli inspired. The wifi works decently enough to work from over lunch, and it has a comfortable, breezy energy. Mother’s Grace – Auroville Rd, Kuilapalayam – Nice, chilled vibe in a shade-friendly setting out of the sun. Slow cooked, tasty Indian food and drinks at reasonable prices. Wifi has worked well. 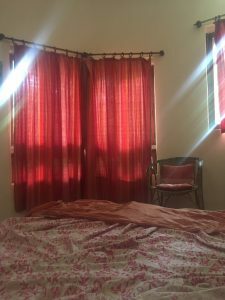 3 Ways Restaurant – Close to Auroville Main Rd, Edayanchavadi – For those seeking a quiet, chill work space in the evenings, 3 Ways features an attic level. Their Indian food selection is terrific, and highly affordable. Wifi is strong. Later at night you’ll observe many dozens of cows chilling outside in the parking lot. Bread and Chocolate – MDR, 1115, Auroville Main Road, Kuilapalayam – Delicious, high end coffees, pastries and sandwiches. The affogado vegan ice cream and coffee plunger combination is excellent value for dollar. Warning: Already the most expensive cafe in the area, my final visit included an inexplicable tax and service charge rip off. Dreamers Cafe – Auroville Visitor’s Centre. This is more of a note on why not to consider working from here. First, as the initial entry point for virtually all visitors to Auroville, it is far too touristy. Wifi has never really worked for me, over multiple visits. That said, it’s a great, central place to meet up with new friends, and the vegan chocolate ice cream must be tasted! The food in Auroville is often spectacular. Mostly local ingredients are sourced fresh, and there is a high level of quality across a great number of nearby establishments. Beyond the wifi options listed above, there is no shortage of quality, affordable restaurants in and around Auroville. I can’t recall eating so consistently healthy, with an abundance of fresh, organic ingredients. Typically Indian prices – a few dollars per plate. Solar Kitchen – Organic, vegan food, served lunch and dinner, in a busy, social atmosphere. Only a few dollars. For this you will need an AuroCard, through registration at Town Hall. Naturellement – A little pricier, but absolutely wonderful. Fresh baked breads for sandwiches, homemade pastas. Excellent assortment of tasty juices. Plan B – A very popular spot just outside of the main gate. Particularly busy on Sunday evenings – make sure you arrive early enough, or they’ll run out of classics like paneer. Tasty and cheap! Le Sigdi – Perhaps the finest restaurant in Auroville? Le Sigdi offers a quaint garden setting and a pleasant variation of dishes. Surprisingly, without the additional price tag. Saturday Night pizza at Youth Centre – A R200 contribution gains you unlimited, all-you-can eat wood-fired pizza. Prepare to eat a lot! You’ll also meet a lot of interesting people, irrespective of age. Tanto Pizza – There is a pizza craze in India. Tanto is one of several Auroville-area establishments that bake their pizzas in an Auroville-made wood-fired pizza oven. It’s a little pricey and you’ll hear some murmurs about their place in Auroville, but if you’re looking for a decent pizza restaurant, check it. For those looking for more traditional cuisine, there is a street stall outside the main gate in the mornings that serves dosas and masala chai, for R20-30 per dosa. Auroville is akin to a nature-inspired playground. There are countless places inside and outside to explore. Regular workshops and riveting one-off events. It’s challenging to find out everything that happens. Locals recommend you visit artservice.auroville.org, though this website is not the most usable or accurate. What Auroville is NOT, is a party zone. Drugs, alcohol and even smoking are prohibited. For the party vibe, stay outside of the centre, and visit nearby city Pondicherry. Auroville is geared towards people seeking more out of life than the party scene. 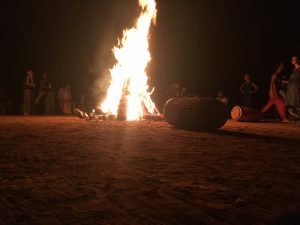 That said, we did attend a small rave in a faraway fields on the outskirts of Auroville, that served “bhang” (marijuana) lassis. 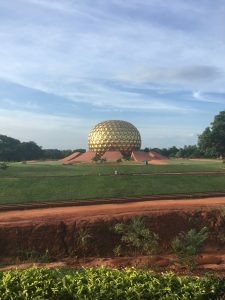 Matrimandir – The most famous landmark of Auroville, this space-age, golden golf ball hosts one of the most spectacular interiors in human design history. A full meditation chamber, with smaller meditation pods, it is a truly special place to visit. You need to register at the Visitor’s Centre, 1-3 days before. There is a short 15 minute video before a shuttle bus ahead of the guided, solemn visit. Sadhana Forest – An international revelation in its approach to sustainable ecosystems. Helped transform Auroville from a desert to a rainforest, and is setting up similar self-sufficient food and plant systems in other parts around the world. Every two Fridays there is a tour, free dinner and movie presentation at this beautiful place. Cinema Paradiso – Auroville’s underground cinema hosts multiple films most nights, free of charge. French, Russian, English, Indian and more. Svaram – Ingenious creators of creative, custom musical instruments. Some are huge, many are seemingly simplistic, using natural materials like stone and wood. Includes a small outdoor park for you to play with some of their creations, and an inside shop for you to play with more. 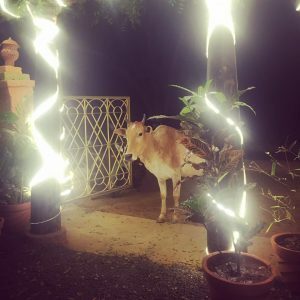 Auroville Radio – Broadcasting 24/7, Auroville Radio unites the community with stories and sounds from around Auroville. Pony Farm – Kids can enjoy pony rides and learning more about the lives of happy horses. African Pavilion – This campground hosts weekly drum circle on Thursdays as well as providing traditional African food. Aikido – The peaceful, non-confrontational martial art of Aikido transforms and subdues any attacking energy through a series of small, natural movements. Numerous classes each week, for all skill levels. Botanical Gardens – Auroville is home to a spectacular collection of flora and fauna at their massive Botanical Gardens. Free to visit, put aside hours to explore. Yoga at Verite, numerous other places – Yoga is a popular pastime in Auroville, as it is in much of the world. There are many yoga practices in Auroville, highlighted by the impressive facilities and feminine vibes at Verite. Concerts at Cripa and other places – Keep an eye on noticeboards and online for happenings around Auroville. There are regularly excellent, unique live performances of music, art, dance, poetry, and more. Keep your ears open and be receptive to invitations! In Auroville, you often have to dig deeper. Any interaction with Aurovillians is a true bonus! To stay in Auroville, you send enquiries through the Auroville guesthouse website. Filling out your details at each prospective residence results in a reply with details from the house manager. There is a wide variety of different guesthouses at which to stay in Auroville, each with different themes, styles and intentions. Some require more lengthy stays, often at least a few days or a week. Prices depend on the quality of the room and the guesthouse itself, but are generally far less than you would pay at a city hotel. 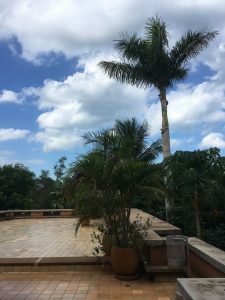 Transformation – I stayed here on my first visit. Transformation Guesthouse is quiet, secluded, with a gorgeous swimming pool. The architecture is beautiful, and rooms are spacious. Family friendly. 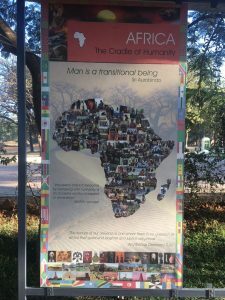 African Pavilion – If camping is more your vibe, you can stay at African Pavilion for a few dollars a day. 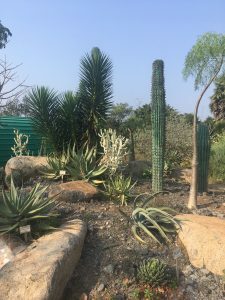 It is expected that you volunteer at least a few mornings a week, helping with landscaping, gardening, learning new means of sustainable irrigation, cleaning – whatever you feel like! Each Thursday there is an African drum circle and traditional African food. Green’s Eco Guesthouse – a well-regarded hostel just outside the main gate. Rusty Rabbit – on Auroville main road, a newcomer that many guests enjoy. Features a lovely rooftop that is sometimes a restaurant, or useful as a chill/workspace during the day. Auroville is easily reached by bus from major cities Chennai and Bangalore. Pondicherry is the nearest city of note. 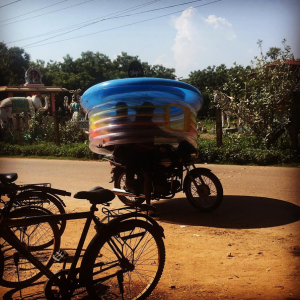 Chennai to/from Auroville – Shared Transport Service / UTS. Best to share, which may cost you up to R1000, or you’ll foot the general R2000 bill yourself. Take public buses. Take a train from Chennai Airport, then a bus to Pondicherry. This takes longer, but is an authentic Indian experience, and extremely cheap – I believe less than R100 for the entire combination. To/from Pondicherry, a moto taxi or rickshaw will cost you R300-400, depending on the driver and time of day or night. Always negotiate the price first, and know you can almost always shave R50-100 off the offered price. Having arrived in Auroville, rent a moped (R70 per day) or scooter (R150-250 per day). A bicycle is fine, but will limit your options for further places. I’ve known a few people who choose to walk everywhere. A scooter is greatly recommended! With my visits and stays in India increasing, my heart grows in Auroville. The balance of connectivity and being able to step away from it all. The close connection with spirituality, with a harmonious blend of Western and Indian values and creations. 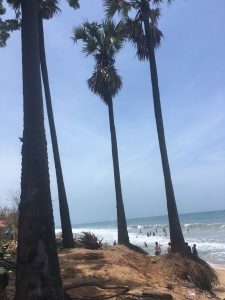 I noticed many other digital nomads working from laptops in the relaxed confines of Auroville, and it appears to be gaining traction as a hotspot. 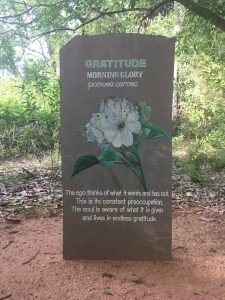 For those seeking to develop their spiritual growth and become a more conscious human, while working away on the regular necessities to support your life, Auroville is worth a visit. 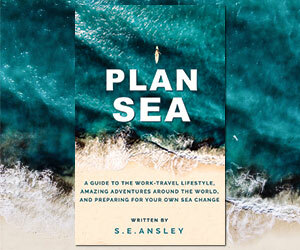 Put aside a couple of weeks to explore, and see what you think. Try to dig a little deeper beneath the surface. At the very least you’ll have experienced one of the most special, conscious-oriented places on the planet, and learned a few new things. And perhaps it will inspire your own life and mission to greater heights, when you see what more beyond today’s world we are capable of as a human society. Count me among one digital nomad in Auroville considering the plunge for a more extended stay, and perhaps even a move there one day.